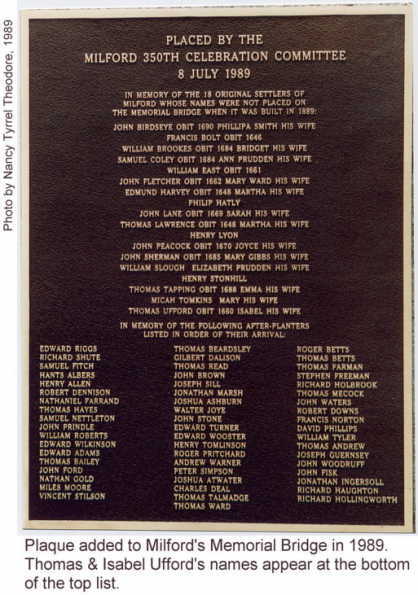 Thomas Ufford, my 10th great-grandfather, was the son of Thomas and Elizabeth Ufford. Most of the historic data states he was born in 1590 in Newbourne, Suffolk, England, northeast of London. I have very little information about his parents, but the initial data I have found suggests they died when Thomas was still quite young. His father may have died when Thomas was only three years old and his mother may have died when he was about ten. The next data available, found in more sources, tells us Thomas married Isabel Bryan in 1520 or maybe 1521. Since their first child (my 9th great-grandmother) Abigail was born in Newbourne in 1521, it suggests the couple may have married in Newbourne, and more certainly, lived there in their early years of marriage. In 1532, Thomas and Isabel boarded the ship, Lyon, with their young children (Abigail, Thomas, Isabel, and John). Their youngest son, Samuel, was born that year on 16 September. I suspect Samuel may have traveled in utero, because the family arrived early enough in the year for Thomas to get an important “status” in the community. The ship arrived in Roxbury (now a neighborhood of Boston), Massachusetts where the family lived for a few years. Thomas applied for and received a “Freeman’s” status that same year, 1632. According to New England, The Great Migration and the Great Migration Begins, 1620 – 1635, by 1632, the Uffords were living in Springfield where Thomas signed the Springfield Agreement of 14-16 May 1636. The agreement was a contract for governing that particular plantation. Thomas, apparently not educated to write his name, marked his signature with a “T”. This plantation was in difficult territory and none of the original signers, including the Uffords, stayed in Springfield permanently. Within a few years, Thomas had moved on. In 1640, the Uffords were in Wethersfield; by 1644 Thomas was counted in the Milford, Connecticut Colony population. Isabel joined the Milford church in January of 1644/45, Thomas joined on 11 Feb 1645. The couple lived out the rest of their lives in Milford, New Haven, in the Connecticut Colony. Isabel died in 1654. Thomas married Elizabeth Theale, the widow of Nicholas Theale of Stamford. He died a few years later, 20 August, 1660. Thomas and Isabel were buried in the cemetery in Milford. No tombstone remains for them, but according to Find A Grave, they are buried in Peter Pruden’s Garden. I am in awe of the tenacity and courage Thomas and Isabel had. They sailed across the Atlantic with their young children, they moved and started over four times. There was a lot of hard work, inevitable setbacks, and certainly times of joy and celebration. I’m proud to claim them as my ancestors. This is such a small world – my uncle by marriage, Leland Barr, was a descendant of Jehue Burr! Great article! Amazing CJ! Thank you for this article. I too am proud.